Drizzle with Olive oil and sprinkle with Smoked Paprika to serve. 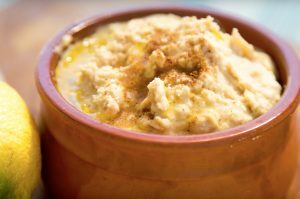 To make the Hummus place the drained chickpeas into the blender jug and add all the other ingredients. Pour in half the reserved chickpea juice and turn your blender onto pulse. Pulse for 20-30 seconds or until the consistency that you desire is reaches. Add the remaining chickpea juice if the hummus id too dry. Taste the hummus and add any extra flavourings that you may require. 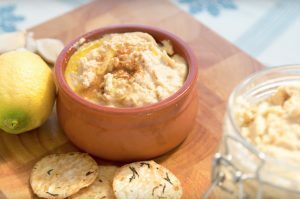 Decant the Hummus into a serving dish and drizzle with olive oil and paprika before serving. Enjoy!